The University of Arizona was at the forefront of one of medicine’s greatest breakthroughs when a Tucson researcher and surgeon developed the first viable artificial heart. So it makes sense that a noted cardiac surgeon has found his place at the helm of the UA, a leader in cardiothoracic research and training. 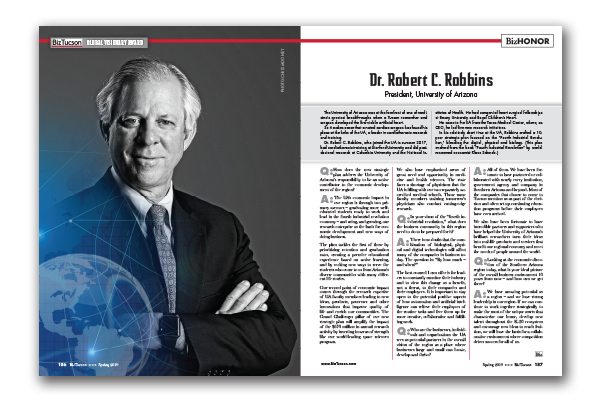 Dr. Robert C. Robbins, who joined the UA in summer 2017, had cardiothoracic training at Stanford University and did post-doctoral research at Columbia University and the National Institutes of Health. He had congenital heart surgical fellowships at Emory University and Royal Children’s Heart. He came to the UA from the Texas Medical Center, where, as CEO, he led five new research initiatives. Q: How does the new strategic plan address the University of Arizona’s responsibility to be an active contributor to the economic development of the region? A: The UA’s economic impact in our region is through two primary avenues – graduating more well-educated students ready to work and lead in the fourth industrial revolution economy – and using, and growing, our research enterprise as the basis for economic development and new ways of doing business. The plan tackles the first of these by prioritizing retention and graduation rates, creating a premier educational experience based on active learning, and by seeking new ways to serve the students who come to us from Arizona’s diverse communities with many different life stories. Our second point of economic impact comes through the research expertise of UA faculty members leading to new ideas, products, processes and other innovations that improve quality of life and enrich our communities. The Grand Challenges pillar of our new strategic plan will amplify the impact of the $670 million in annual research activity by investing in areas of strength like our world-leading space sciences program. We also have emphasized areas of great need and opportunity in medicine and health sciences. The state faces a shortage of physicians that the UA is filling with our two separately accredited medical schools. Those same faculty members training tomorrow’s physicians also conduct cutting-edge research. Q: In your vison of the “fourth industrial revolution,” what does the business community in this region need to do to be prepared for it? The best counsel I can offer is for leaders to constantly monitor their industry and to view this change as a benefit, not a threat, to their companies and their employees. It is important to stay open to the potential positive aspects of how automation and artificial intelligence can relieve their employees of the routine tasks and free them up for more creative, collaborative and fulfilling work. Q: Who are the businesses, individuals and organizations the UA sees as potential partners in the overall vision of the region as a place where businesses large and small can locate, develop and thrive? A: All of them. We have been fortunate to have partnered or collaborated with nearly every institution, government agency and company in Southern Arizona and beyond. Most of the companies that choose to come to Tucson mention us as part of the decision and often set up continuing education programs before their employees have even arrived. We also have been fortunate to have incredible partners and supporters who have helped the University of Arizona’s brilliant researchers turn their ideas into real-life products and services that benefit our regional economy and meet the needs of people around the world. A: We have amazing potential as a region – and we have strong leadership in our region. If we can continue to work together strategically to make the most of the unique assets that characterize our home, develop new talent throughout the K-20 ecosystem and encourage new ideas to reach fruition, we will have the basis for a collaborative environment where competition drives success for all of us.